Get your NerdKit right now! The new USB NerdKit in action! plus everything else as listed on the Kits page. This package contains everything you need to get started learning electronics with microcontrollers! NEW: See what reviewers on Amazon.com are saying about this kit! Supports Windows, Mac, and Linux. We're temporarily out of stock. Leave your e-mail on the Feedback Form and we'll contact you when we have more kits ready to ship. The LED Array expansion kit is an add-on to your USB NerdKit that lets you create a custom 5x24 pixel scrolling marquee. We're temporarily out of stock. Leave your e-mail on the Feedback Form and we'll contact you when we have more of these ready to ship. A powerful full-function multimeter for your electronics workbench. A very portable and convenient multimeter for everyday use. This contains all the core parts you need to put together an additional microcontroller project using the knowledge from your first USB NerdKit. This microcontroller has double the memory space of the ATmega168 above, and is a simple upgrade for our customers, or for consideration with new projects. More details are available in the "ATmega328P Upgrade Nano-Guide" in the Members Downloads section for current customers. This is an extra MOSFET transistor (four of which are included in the USB NerdKit above), used in many of our projects, including Motors and Microcontrollers 101, iPhone-controlled R/C car, and Servo Squirter. It may be useful for controlling motors and other higher-power loads. See the datasheet for full details. Regulates any DC input voltage 8V-35V from a battery or wall adapter down to 5V for use by the microcontroller, LCD, and other parts. This is an extra microcontroller in case you need a replacement or just need another for your projects! Also see the "Build Your Own Project Package (ATmega168)" above, which contains a breadboard, crystal, and capacitor as well as this microcontroller. Also see the "Build Your Own Project Package (ATmega328P)" above, which contains a breadboard, crystal, and capacitor as well as this microcontroller. This is an extra temperature sensor (one of which is included in the USB NerdKit), useful for our Digital Meat Thermometer project or your own temperature-related projects. This is an extra switch (two of which are included in the USB NerdKit), useful as digital inputs or for power. This is an extra USB to Serial cable (one of which is included in the USB NerdKit), useful for extra projects needing to communicate with a computer, or for programming microcontroller pre-loaded with our bootloader. This is compatible with Windows, Mac OS X, and Linux. Our USB NerdKit includes a wire set like this one, but if you need more for your projects, pick up this handy assortment. We're temporarily out of stock. Leave your e-mail on the Feedback Form and we'll contact you when we have more ready to ship. For other parts, please e-mail us at and we can send you a custom PayPal invoice. "Thank you for putting this kit together. I received the kit as a Christmas gift and have been playing with it for a while now. It's a great introduction to digital electronics and the way you have set it up is a real educational experience. Thanks!" This is not a pre-assembled circuit board. This is a learning experience, where you'll build the circuit for yourself, and you'll come to understand why you've done each step. The two designers of NerdKits have spent thousands of hours in classes at MIT, learning from the best of the best about electrical engineering and computer science. We've spent years tinkering in our own basements and achieving both frustration and joy. But recently, we realized that what we're really passionate about is teaching others, seeing that spark go off in their heads, and watching them succeed. When you look at the offerings from NerdKits' competitors, you'll find one of two things: either a development kit meant for people with formal technical training and a specific project in mind, or a dumbed-down kit that holds your hand but doesn't tell you why. We think NerdKits represents a balance, empowering you with real tools (an LCD screen and a C compiler among them), and giving you instructions plus intuition that will really send you on your way to understanding. We've watched so many people try to get started with microcontrollers, but fail when overwhelmed with the (sometimes conflicting) information online, and the lack of intuition that is hard to teach. But we want you to feel the same thrill of engineering that has delighted inventors for centuries, and in order to do that, we need to both get you on your feet, and also give you powerful tools. 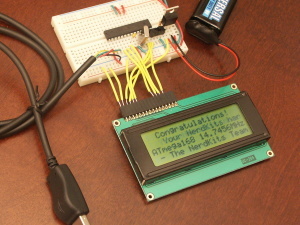 We think that starting with microcontrollers the NerdKits way will save you time, money, and frustration -- and ultimately, will make it much more likely that you'll be able to successfully build something cool and not give up. To make your decision easier, for a limited time, we're offering a guarantee that you'll get your first program written and running -- and that alone will put a big smile on your face. If you have trouble following the instructions in The NerdKits Guide, contact us at and we'll do our best to help. But if you're still not successful, contact us within 30 days, send the NerdKit back to us, and we'll refund your purchase price. It's as easy as that. We want you to be successful with this new hobby. Invest in yourself. Scroll up to the "Add to Cart" button, and take action right now. Excellent transaction....my son is very happy....Thanks!!! nice item, great seller... thanks!............hey, make a DSP and FPGA kit too! good documentation; easy setup; works fine; Thank you! Arrived promptly, nicely packaged. Great communication from seller. Wonderful seller! Great communication & super fast shipment - highly recommend! Above and beyond excellent! Amazingly helpful for beginners. Highly recommended! Sure, it's hard to squeeze one's thoughts into an 80-character eBay feedback, but we have happy customers and we know you'll learn a lot too! "Just wanted to thank you for speedy shipping, good packing, fine parts selection, visually exciting, well written manual, great value." Note: we're happy to ship internationally via USPS Priority Mail International or USPS First Class International. We've shipped kits to Australia, Austria, Barbados, Belgium, Bosnia and Herzegovina, Brazil, Canada, Chile, Croatia, the Czech Republic, Denmark, Estonia, Finland, France, Germany, Greece, Honduras, Hong Kong, India, Ireland, Israel, Italy, Japan, Latvia, Luxembourg, Malaysia, Malta, Mexico, the Netherlands, New Zealand, Norway, Poland, Portugal, Romania, Russia, Saudi Arabia, Singapore, Slovakia, Slovenia, South Africa, South Korea, Spain, Sri Lanka, Sweden, Switzerland, Taiwan, Turkey, the United Arab Emirates, the United Kingdom, and US APO/FPO addresses -- 50 countries in all. (This list keeps growing!) If the "Check out with PayPal" button on the shopping cart page doesn't have shipping data for your country (or shows a placeholder like $999), please e-mail us at and we'll get back to you ASAP! Registered students, faculty, and staff (both at the college and high school levels) can now receive a 10% educational discount. We'll send you a custom PayPal invoice with the reduced price. To get this discount, please e-mail us at and tell us your shipping address, and we'll send you the invoice with discount. Please either send this from a .EDU e-mail address (must be linked to your PayPal account), or include proof of your enrollment or affiliation -- for example, a scan of a student ID card (feel free to blur out ID numbers). Note: We can not apply any educational discount after an order has already been placed. The educational discount also does not apply to orders placed via eBay or Amazon. "Actually both are gifts - the first one was supposed to be for my son in Oregon, but then I decided to give his to my future son-in-law in Taiwan so I needed to then buy a replacement for my son. The NEXT one I buy will be for me.